Brenda Weitz sews table covers for trade shows at Totally Promotional in Coldwater in Mercer County on Sept. 11. The growing manufacturer, which prints logos and names on promotional items for companies, doubled its workforce since 2014. Now the company boasts 302 employees, according to Chief Operating Officer Lynn Huwer. This year saw the greatest number of hires, causing them to expand their manufacturing workspace to 192,830 square feet between their production facility and office facility. Mercer County has the lowest unemployment rate in the state of Ohio. 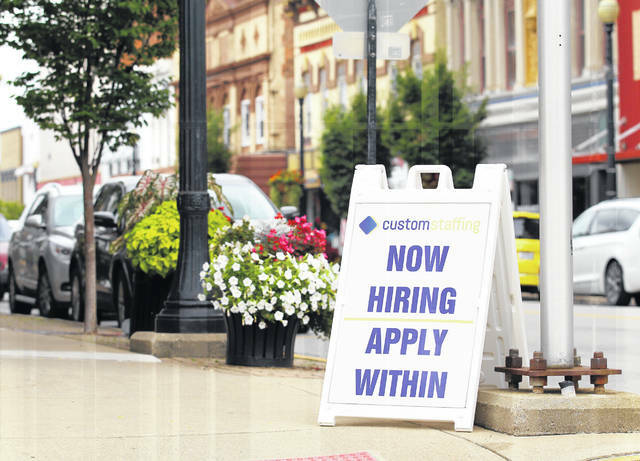 “Now hiring” signs are everywhere in Auglaize and Mercer counties, including this one in downtown Wapakoneta. Auglaize County saw a 23 percent jump in employment from 2000 to 2017. 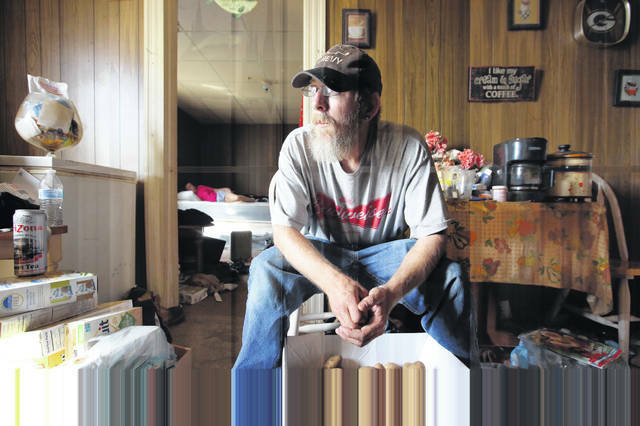 “I’m doing what I have to do to survive,” says James McIntire, 46, as he sits among boxes of food from a local food pantry inside his cluttered, two-room apartment above the barbershop in downtown Woodsfield in Monroe County on Oct. 5. His girlfriend, Brenda Maupin, 58, rests on a bare mattress in the bedroom in background. McIntire says the food from the United Church of Christ next door helps him fill in the gaps between his odd jobs as as a grass mower and auto mechanic. 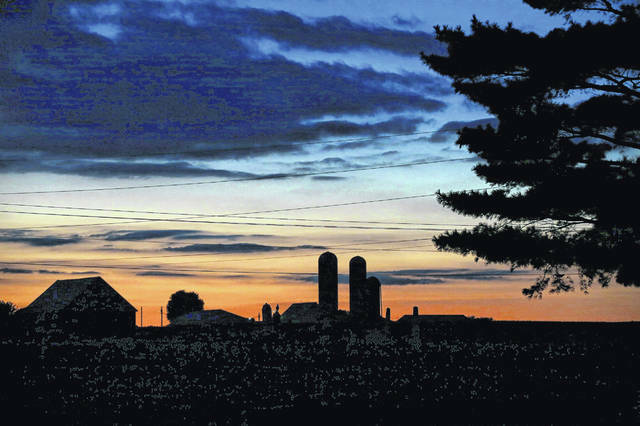 The sun sets behind farm silos in Carthagena, just south of Celina in Mercer County on Sept. 11. Miles of lush farmland can be seen in every direction like this farm off of Sebastian Road in Celina on Sept. 11. Dustin Kaiser, 18, is currently a senior at Fort Recovery High School. Here he works on a “knee drill” at the Frank Dennings Vocational Building in St. Marys, where he goes for part of his school day. Kaiser already has been hired and works at JR Manufacturing in Fort Recovery. Diners eat at J. Marie’s Wood-Fired Kitchen and Drinks in downtown Wapakoneta in Auglaize County on Sept. 12. The diverse of economies of Auglaize County and neighboring Mercer County support vibrant downtowns such as Wapakoneta. Auglaize County saw a 23 percent jump in employment from 2000 to 2017. 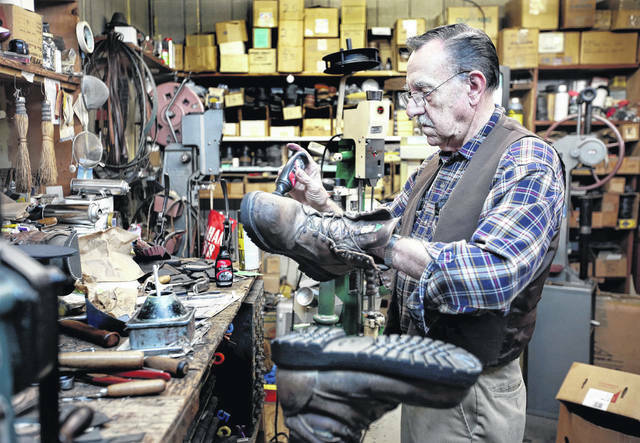 Chester Barrett, 77, puts on the finishing touches on a work boot at Goodyear Shoe Repair in Wapakoneta on Sept. 12. Chester Barrett bought Goodyear Shoe Repair in downtown Wapakoneta in 1980. Barrett still works here with his son, Dale Barrett, 49, where their speciality is repairing work boots. A dying art, they fix shoes from all over the country, including Italy and France. CELINA — In Ohio’s western breadbasket, amid thousands of acres of lush Mercer County farmland, grows an economic engine that is fueled by small- and medium-sized manufacturing companies that are cultivating new businesses and steadily growing older ones. Throughout the county’s cities and the villages, help-wanted signs as prevalent as street markers offer notices of job openings for machinists, welders and other trades. In a state hard hit by years of economic downturn, Mercer County stands out: It has one of the most prosperous economies in Ohio and is among its leaders in job growth. It boasts the state’s lowest unemployment rate: 2.5 percent in September. It has held that title for 30 consecutive months. Four hours to the southeast, across Ohio and into the rolling curves of the Appalachian foothills, machines mine the landscape for oil and gas. The rare help-wanted signs are mostly for jobs at fast-food restaurants. Monroe County is the state’s second-smallest county, with about 14,000 residents. Devastated by two major aluminum plant closings and a withering coal industry, it faces the highest unemployment rate in the state, 6 percent in September. It has had the highest rate of unemployment in Ohio in 11 of the last 12 months. In Ohio, there are many more counties like Monroe than Mercer. Three-quarters of the state’s 88 counties have failed to recover all the jobs lost from the two recessions so far this century, in 2001 and 2007-2009. Those counties, which are home to nearly 7 of every 10 Ohioans, have gone nearly 20 years — a full generation — without any net growth in employment, according to data from the U.S. Bureau of Labor Statistics. Cuyahoga County is one of them. It lost more than 97,000 jobs from 2000 through 2017. Which leads to the question: Why are Monroe and so many other counties struggling while Mercer and a handful of others are thriving? An unexpected answer can be found in Mercer, where the very thing that has devastated other counties across the state is driving its prosperity: manufacturing. The county has leveraged innovative leadership; a homegrown, skilled workforce; and easy access to highways that stretch across the Midwest to provide products for major automotive, agricultural and construction firms in the region and nationwide. Between 2000 and 2017, total employment in Mercer County climbed by nearly a third, to 20,044. During that same period, manufacturing jobs shot up nearly 80 percent, from 3,859 to 6,904, according to federal jobs data. Those 3,045 new manufacturing jobs account for two-thirds of all 4,643 jobs created in the county in that time period. Jeff Grieshop, 39, is a face of that growth. In high school, he and his brother Doug took their first steps in the business world by renting a large tent to families for parties and festivals. The brothers and their family soon realized that they could make their own tents and expand. A business that began in the basement of the family’s home took off in the 2000s. Today, it provides tents and tarps to the U.S. military, as well as to various defense contractors. The company employs about 120 people. “We’re growing, and so is the area,” Grieshop said. Also in Mercer, Celina Aluminum Precision Technology is making pistons and other high-tech material for Honda. It has grown from about 200 employees in 2000 to about 600 today. Coldwater Machine Co. is another example. It designs and builds equipment for the automotive and aviation industries. It has expanded three times since its founding in 1954 and now has 110 employees. 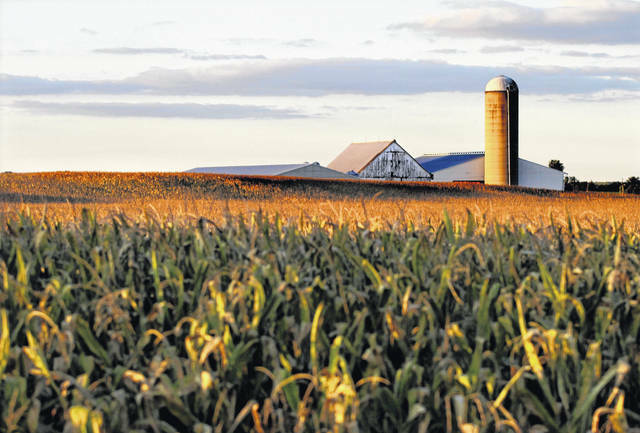 The small to midsize manufacturing plants in the county are scattered among the corn and soybean fields and tucked inside older industrial plants. Some are in custom brick-and-mortar buildings, others occupy pole barns. The impact of those businesses can be measured in dollars, as well as in the number of jobs. Manufacturing jobs pay well. For instance, the average pay for manufacturing jobs in Mercer County is $45,400, compared to $35,900 for all other jobs in the county, according to the federal data. Those paychecks add up. Last year, Mercer’s manufacturing companies pumped more than $313 million into the wallets of their workers, which is nearly an 80 percent jump in total payroll since 2000. Growth in manufacturing also has a domino effect on the local economy by stimulating the creation of jobs in other sectors, Tonelson said. That can be seen throughout Mercer, which has a population of 41,000. 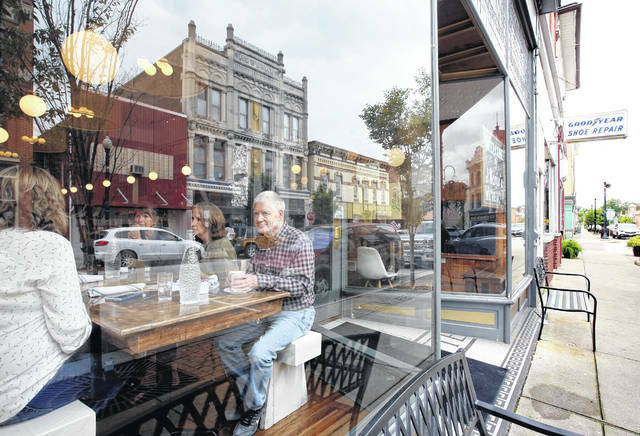 It is especially noticeable in Celina, Mercer’s county seat, where storefronts are filled, restaurants have waiting lines and traffic is often backed up in the early afternoon. Jared Ebbing, the economic development director of Mercer County, recognizes the growing role of manufacturing in the county’s economy. “We have always been known as the breadbasket of Ohio,” he said. “I would like to be known as the cradle of advanced manufacturing. As development director, Ebbing actively pushes for diversity in economic growth. But he does more than recruit businesses to move to the county, push incentives and help current companies expand. He and other business leaders email college students from the region about possible internships and job openings. They let high school students studying the trades know about local job opportunities. They also are behind an innovative website called Hometown Opportunity, which displays job openings and information about local companies and the community. 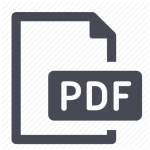 The website posts notices for skilled machinists, welders and other tradesmen, as well as nurses, engineers and accountants. Economic leaders publicize the website on Facebook. Young people who grew up in the region can see there are jobs, should they choose to return home. The site targets areas of the state that have experienced major job loss, struggled, such as Lordstown, which lost thousands of jobs when the GM plant there went from three shifts to one. Kelley Lefeld came back home. After leaving Coldwater, a village in Mercer County, for college at the Illinois Institute of Art, she moved to Chicago and then Bakersfield, California. Family and friends told her about Hometown Opportunity, and through it she applied for, and got, a job in the business development department at Totally Promotional, a designer and manufacturer of promotional items, that makes everything from stadium cups to wedding favors. Continuing growth, especially in manufacturing, requires more and better trained workers, county officials said. That’s the reason businesses jumped behind a 15-year, 0.95-mill levy in 2016 to build a $25 million vocational training facility, named the Tri Star Career Compact, said Tim Buschur, Tri Star’s director. Voters approved the levy by a margin of nearly 3 to 1, and local businesses have given $1 million in equipment to the school, which is set to open next year. The vocational school also will serve neighboring Auglaize County, Mercer’s neighbor to the east. Auglaize, a county of nearly 46,000, saw a 10 percent jump in total employment from 2000 to 2017. Like Mercer County, manufacturing fueled that growth. 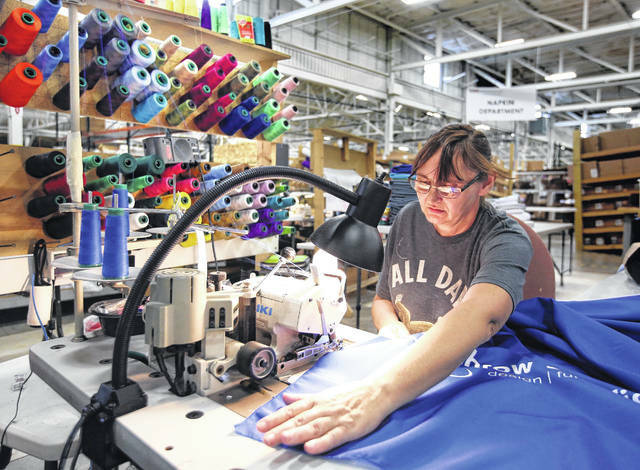 The 631 manufacturing jobs gained in that time period amounted to nearly a third of the 1,939 total jobs created in Auglaize County from 2000 to 2017, according to federal data. Dale Barrett, who owns Goodyear Shoe Service in Wapakoneta, the county seat of Auglaize, sells one of the hottest commodities in the area: work boots. He has first-hand personal experience: His son was offered full-time welding jobs months before he finished high school. Mercer and Auglaize, however, are exceptions. They are among only nine Ohio counties with more manufacturing jobs today than in 2000. They are spread across the state: Butler is in the southwest; Darke is in the west; Delaware, Knox and Madison are in the central part of the state, while Guernsey and Holmes are in the southeast. In most Ohio counties, the ranks of blue-collar workers have steadily dwindled. Overall, manufacturing employment in the state shrank by a third from 2000 to 2017. Many of the state’s large urban counties saw much greater losses. Montgomery County, where Dayton is the county seat, lost nearly half of the 57,000 manufacturing jobs it had in 2000. Trumbull County, in the Mahoning Valley, saw manufacturing jobs plummet by two-thirds, or nearly 20,000. Cuyahoga County lost the most manufacturing jobs of any county: nearly 50,000, a 43 percent drop since 2000. In terms of percentage drop in blue-collar jobs, no county has taken a bigger hit than Monroe. 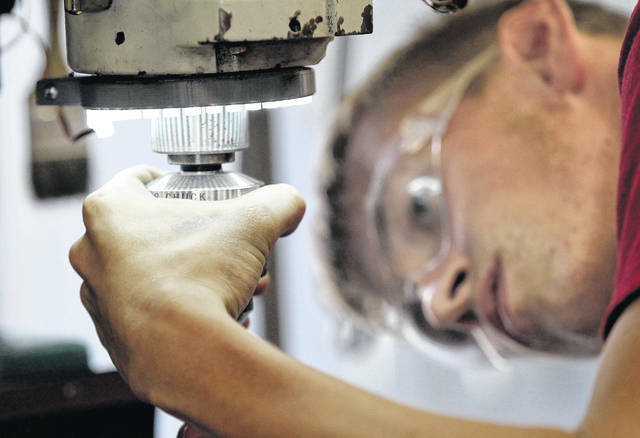 In 2000, the Bureau of Labor Statistics counted an average of 2,301 manufacturing jobs in Monroe County. Last year there were 11. James Barrows is among the statistics. He was 57 when the Ormet Primary Aluminum Corp. in Monroe County laid him off in 2004, after 28 years pouring hot aluminum into molds. The plant shut its doors in 2014. A second plant, Consolidated Aluminum Corp., closed in 2005. More than 2,500 employees worked at the two plants at their peaks. Since he was laid off, he has worked several jobs. Today, at 71, he works three, 12-hour shifts a week as a security officer at a drilling site in Belmont County, just north of Monroe County. He said he does it to stay active and because he enjoys it. He realizes he is lucky to have work. Darrell Craig, 74, deals with the impact of the plant closings every Wednesday. He runs the food pantry at St. Paul’s United Church of Christ in Woodsfield. Over a month’s time, about 150 families show up for groceries. The pantry is one of four in the county. “For a small county, that’s a lot of people who need help,” Craig said. James McIntire is 45 and lives in Woodsfield in Monroe County. He has struggled to find consistent work for seven years. William Calvert knows the challenge well. At 89, he lives in his century-old home near Woodsfield. He worked as a typesetter at the Monroe County Beacon and delivered mail for years. He empathizes with the county’s high school students. “It would be a pretty tough proposition to find a job here (to support a family),” he said. So why has Monroe County’s recovery from the closing of the aluminum plants and the staggering coal industry been such a struggle? Stettner, of the Century Foundation, said one key reason for Monroe County and other communities in Appalachia is a lack of investment capital to attract and grow jobs. Much of that stems from its topography. Companies have a tough time getting products in and out of Ohio’s rugged Appalachia region, economists said. Woodsfield is more than 30 miles, and at least 45 minutes, away from the nearest major interstate, I-77. The county does, however, take advantage of its proximity to the Ohio River. Monroe County’s struggles are similar to many rural communities in the Midwest that had one or two large plants, employing hundreds of workers. In the streets of Woodsfield, storefronts are occupied, but on a day in September, there is little shopping traffic. Schumacher’s colleague, Commissioner Carl Davis, said the effect has been felt throughout the region for years. “We’re in Appalachia, and we tend to have been forgotten,” he said, referring to support from state and federal governments. Hard times are nothing new to Appalachia because of its long-time dependence on coal mining, which hit its peak workforce in Ohio in 1918, according to the Ohio Coal Association. Over the decades, as the mining jobs steadily disappeared, so did the people. The 1900 census counted 27,031 people living in Monroe County, nearly twice as many as today. Hope for an economic resurgence was kindled this decade by the development of new drilling techniques, such as hydraulic fracturing, better known as fracking, which have opened up vast quantities of oil and natural gas within the Marcellus and deeper Utica shale formations that lie beneath large stretches of Appalachia, from Pennsylvania and West Virginia into Ohio. Gov. John Kasich was optimistic about tapping new underground wealth in Appalachia. “We’re talking about a generation who have lived in poverty, and this is an opportunity to pull them out,” he told the Associated Press in 2011. Kasich downplayed concerns about possible water contamination and other health and safety problems caused by fracking, which requires injecting millions of gallons of chemically treated water to break oil and gas free from the shale deposits. He said he was confident regulations could safeguard public health and the environment. Critics doubt the new generation of oil and gas drilling will fulfill the promise of jobs. That’s because many of the high-paying jobs involving the construction of the drilling rigs and pipelines are filled by employees of out-of-state companies who specialize in the work. The drilling, however, has been a handsome windfall for some Monroe County landowners. So has the sale of mineral rights, county officials said. Some residents are making hundreds of thousands of dollars a year, they say. Since 2000, businesses have drilled 967 oil and gas wells in Monroe County, according to the Ohio Department of Natural Resources. Those fracking rigs, some as high as 150 feet, pierce the hillsides in the county in search of profits. Residents talk about huge oil and construction trucks rumbling through the region, pounding the roads and ignoring signs that prohibit the vehicles. Kathy Hoskins, 63, of Clarington, a village off the Ohio River, say the industry is wrecking the landscape off of State Route 536, where she grew up and lives. Residents and officials in Monroe County are hopeful more jobs are in their future. A Thailand-based company, PTT Global Chemical, has spent $100 million on engineering work to determine whether a site in Dilles Bottom, a small town in neighboring Belmont County, is suitable for a $10 billion chemical plant. The plant would process ethane from natural gas and break it down — or “crack” it — into ethylene, which is used to make plastics. It would be the second such plant in the region, as Royal Dutch Shell is constructing a similar plant in Monaca, Pennsylvania. That’s about 100 miles north on the Ohio River from Monroe County. Published reports said about 6,000 construction workers will be needed to build that plant over five years. It will have 400 to 500 workers once construction is complete. PTT Global Chemical and its partner, Daelim Industrial Co. of South Korea, have yet to say whether they will build their plant in Dilles Bottom. But officials in Monroe County are confident, and they foresee quality, high-paying jobs for their residents. Jason Hamman, a corporate consultant in Vermilion, who serves on a contract basis as the economic development director of Monroe County, said he believes the plant would set off a chain reaction of business growth. Hamman said he expects companies would sprout up around the region to supply the plant with parts, equipment and materials. But there are plenty of reasons for caution. Some critics fear what happened when the aluminum plants closed and the jobs were lost: Monroe’s economy couldn’t rebound. That’s the mistake Mercer County officials say they’ve avoided by encouraging a diverse base of highly automated small to midsize manufacturing businesses. “Diversity insulates you from economic downturns,” said Ebbing, the economic development director from Mercer. https://www.limaohio.com/wp-content/uploads/sites/54/2018/11/web1_EconomyCelina34.jpgBrenda Weitz sews table covers for trade shows at Totally Promotional in Coldwater in Mercer County on Sept. 11. The growing manufacturer, which prints logos and names on promotional items for companies, doubled its workforce since 2014. Now the company boasts 302 employees, according to Chief Operating Officer Lynn Huwer. This year saw the greatest number of hires, causing them to expand their manufacturing workspace to 192,830 square feet between their production facility and office facility. Mercer County has the lowest unemployment rate in the state of Ohio. This story was produced in cooperation with Your Voice Ohio, a collaborative of more than 50 news organizations statewide.